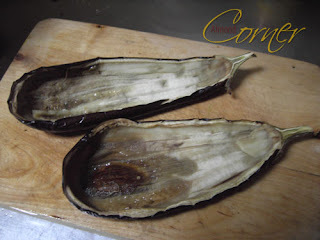 This is one of my favourite eggplant dish. Preheat oven to 200°C. Cut eggplant in half and bake for 25-30 minutes, depending on its size. Cook rice in stock, cut zucchini in small cubes and mix to the cooked rice, season wit pepper. Gouge eggplant and cut in cubes and mix also with the rice. Heat oil and add minced turkey and fry so that it gets wihte, add salt, pepper, cayenne pepper and paprika powder and mix to the rice. 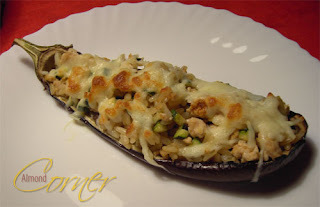 Fill eggplant with the rice mixture, add grated mozzarella on top and bake for 6-8 minutes. 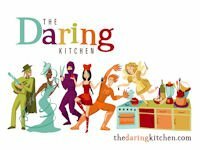 Welcome to the Daring Bakers, good luck with the first challenge! I have plenty of time. :) Yeah I also dun like turkey much, only minced. Hope you gonna like it.